A common medical problem that is often mistaken for cardiac disease is peptic ulcer disease. Peptic ulcers often produce symptoms that can be a challenge to distinguish from angina or even the symptoms of a heart attack. In peptic ulcer disease, ulcers or sores are produced in the lining of the stomach, or of the duodenum (which is the first part of the small intestine). These ulcers are often quite painful. Typically, the pain from peptic ulcer disease is perceived as abdominal pain, often, pain in the pit of the stomach, but sometimes it can cause chest pain. The pain produced by peptic ulcers is often described as a burning or gnawing sensation. It is often relieved by eating a meal and often made worse by drinking alcohol, smoking, or ingesting caffeine. It can be accompanied by symptoms of bloating, gas, nausea, and vomiting. Heartburn is also quite common in people with peptic ulcer disease. Peptic ulcers can occur when the mucus which protects the lining of the upper digestive tract is diminished, or if the production of stomach acid is increased. Conditions that produce peptic ulcers are most common in people whose digestive tracts are colonized by the Helicobacter pylori bacteria. Also, regular users of NSAID pain relievers have an increased risk of peptic ulcers. 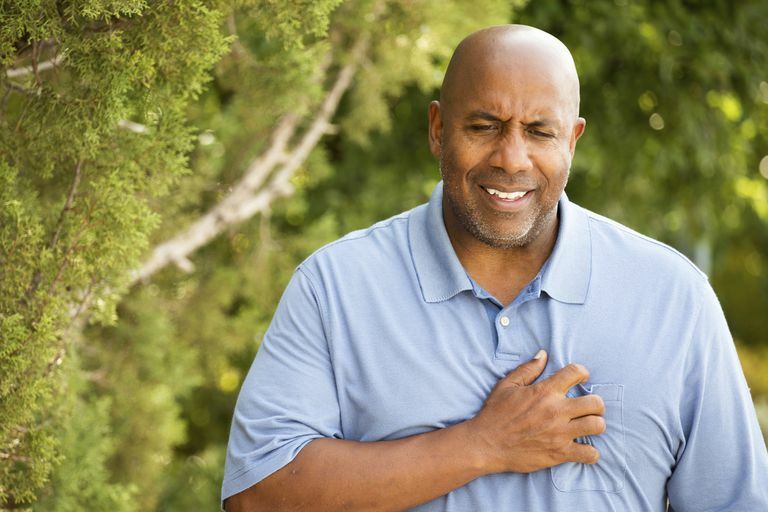 Usually, it is not particularly difficult for a doctor to distinguish chest pain caused by peptic ulcer disease from angina caused by coronary artery disease (CAD). The characteristics of the two types of pain are usually quite different. Peptic ulcer pain is not induced by exercise and relieved by rest, and the gnawing pain accompanied by bloating and nausea is quite different from that of typical angina. Nonetheless, because occasionally angina itself can have a very atypical presentation, it may become important to do confirmatory tests to pin down the diagnosis. Endoscopy (examining the GI tract with a special flexible scope) is the favored method of diagnosis of peptic ulcer disease, especially in people who have evidence of bleeding or have had severe symptoms. Testing for the presence of Helicobacter pylori may also be helpful. X-rays of the upper digestive system may also be recommended. If the doctor is concerned about the possibility of CAD, a stress test may be helpful in distinguishing between these two problems. Antibiotics to get rid of the Helicobacter pylori bacteria. A two-week course of a combination of oral antibiotics is often used. Drugs to block the production of stomach acid. These often include proton pump inhibitors such as omeprazole (Prilosec) and histamine (H2) blockers such as ranitidine (Zantac). Antacids to neutralize stomach acid. In rare occasions, a stomach ulcer will fail to heal with such measures, and surgery will need to be considered. However, with the medications that have been developed over the past few decades, the need to do surgery for peptic ulcer disease is now far less common than it used to be. Barkun A, Leontiadis G. Systematic Review of the Symptom Burden, Quality of Life Impairment and Costs Sssociated with Peptic Ulcer Disease. Am J Med 2010; 123:358. Gururatsakul M, Holloway RH, Talley NJ, Holtmann GJ. Association Between Clinical Manifestations of Complicated and Uncomplicated Peptic Ulcer and Visceral Sensory Dysfunction. J Gastroenterol Hepatol 2010; 25:1162.